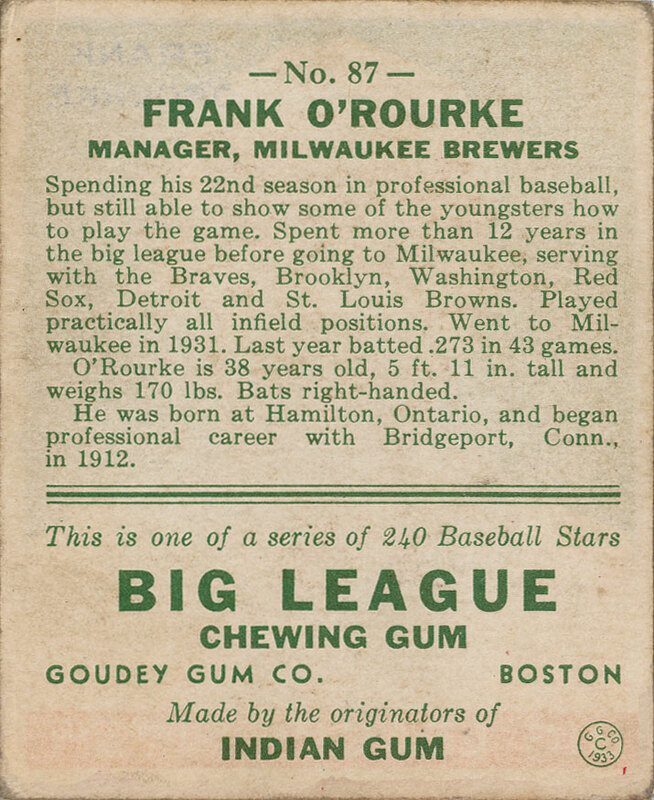 This 1933 baseball card features Milwaukee Brewers third baseman/manager Frank O'Rourke. 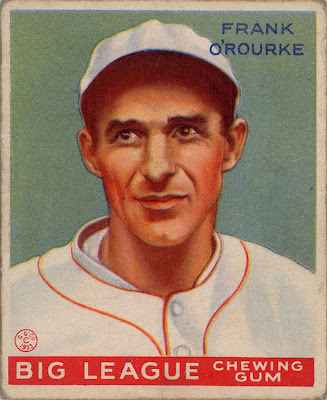 O'Rourke was hired late in the 1931 season by Brewers president Louis Nahin to replace the fired Marty Berghammer. For much of that season, it was widely reported that Nahin had been trying to pry the third baseman away from the St. Louis Browns, where he had been riding the bench. Never known as a great hitter, O'Rourke had managed to string together a career in the majors for parts of 14 seasons on the strength of his glove. What wasn't known is that Nahin intended to make O'Rourke his new skipper; other than a few days in charge of the Binghamton Bingoes at the end of the 1919 season (which disbanded immediately thereafter), he had never been a manager at any level. The new skipper led his Brews to a third place finish in 1932 with an 88-78 record. 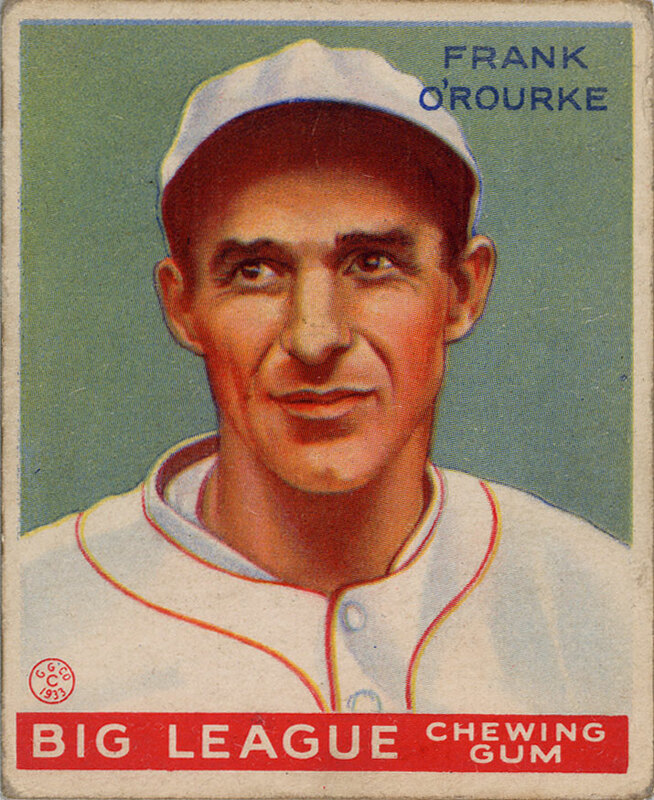 His club stumbled to 67-87 in 1933, the year O'Rourke was immortalized on this card, good for seventh in the American Association. After that year, the Brewers were sold and both Nahin and O'Rourke were fired. The skipper was succeeded by Al Sothoron. 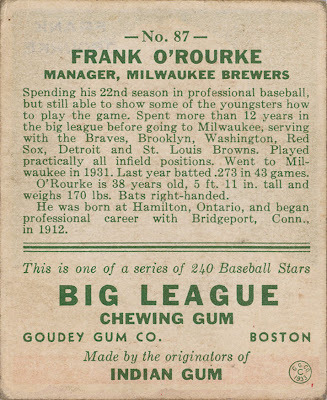 The card itself is interesting; issued by the Goudey Gum Company, this 1933 series was the first trading card set to come with bubble gum. Before this, trading cards were premiums given away with candy or cigarettes. With this set, all that would change, and soon the cards themselves would become the draw.